The University of Southampton Science Park in Chilworth is a hub for innovation, a home for entrepreneurs, including a host of SETsquared companies. Until recently, wayfinding was a challenge faced by the many visitors to the Science Park, whether they were there to attend meetings, interviews or carry out deliveries. 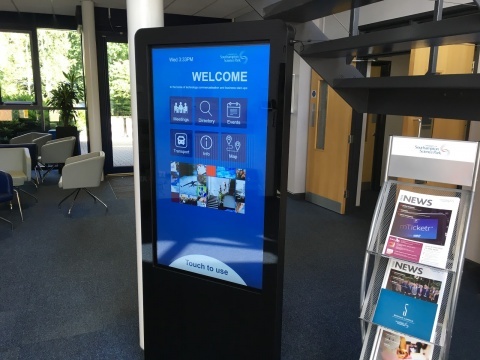 SETsquared Southampton company, TrouDigital, were approached to find a solution for this problem as experts in digital signage. With a small team of web developers, they set about creating a bespoke solution for the Science Park, designing its mapping function and user interface. This first involved writing digital floor plans for the Science Park’s various offices, based on blueprints of the buildings. Once all the rooms and facilities were inputted, tenant companies were assigned to their offices. 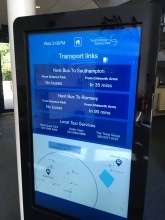 This approach would allow for the real-time mapping of routes using ‘start points’ as the interactive wayfinding kiosks, found in the Science Park’s many reception areas. From an administrative perspective, TrouDigital were able to provide a back-end system that would allow the Science Park to easily update tenant locations and information, a necessity in an ever-changing environment. Beyond a company search directory that usefully provides contact details as well as mapping out a route, TrouDigital wanted to maximise the value their wayfinding kiosks offer. Additional features include integration with the Science Park’s meeting room booking system; a timetable of upcoming events; and live transport information. A project that began with a simple goal to demystify the Science Park’s confusing corridors evolved into a trou wayfinding innovation. Users have more than highly readable maps at their fingerprints – they have access to a wide range of information about the Science Park and the companies based there.